Have a little fun and just in time for the month of October! 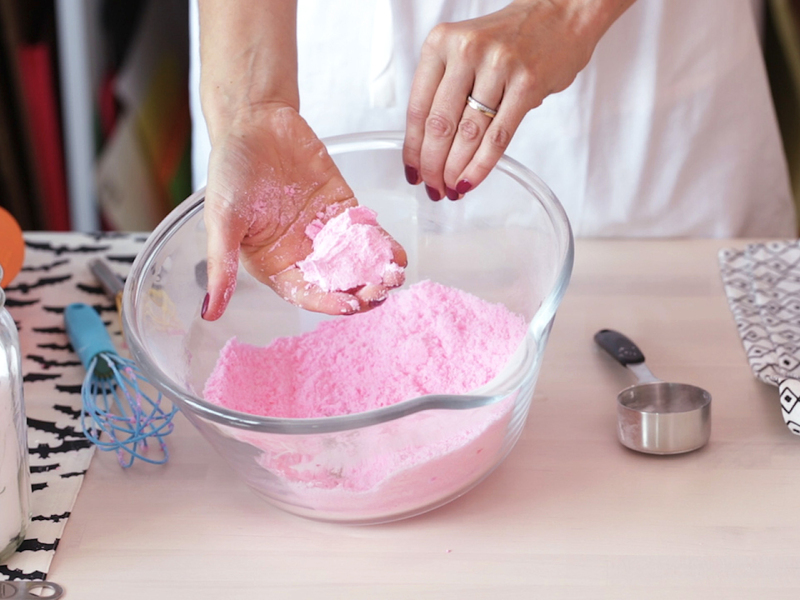 Safety first: Although the ingredients are non-toxic, they are quite powdery. Wear a mask to avoid breathing them in especially little kids who are close to the mixing bowl. Whisk the dry ingredients in a large bowl and mix the wet ingredients in a measuring cup with a fork or small whisk. Slowly add the wet mixture to the dry while whisking. Add a few drops at a time until well incorporated. Knead with hands until mixture feels like wet sand and holds togetherÂ when squeezed. Pack your mixture very tightly into a mold. Like, really pack it in. 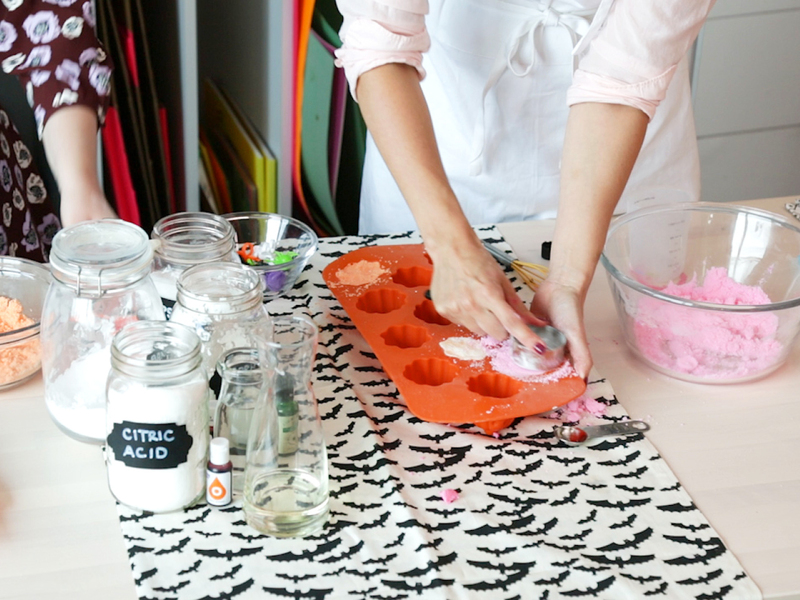 You can use muffin tins, recycled yogurt containers or soap molds. We used Halloween-shaped silicon baking molds from the dollar store. Let your bath bombs dry overnight. Pop them out and have a bath! Store your bombs in a glass or plastic containerÂ to prevent cracking over time. The mixture was a bit too wet and became activated. Push them back down andÂ pop them in the oven at 200 degrees for 10 minutes to dry them out. Even if they puff up, you can still use them. This means that they arenâ€™t quite set. Try leaving them to dry a little longer. If your eagerÂ bathers just canâ€™t wait, pop them in the fridge for 30 minutes to speed up the process. The mixture was too dry. 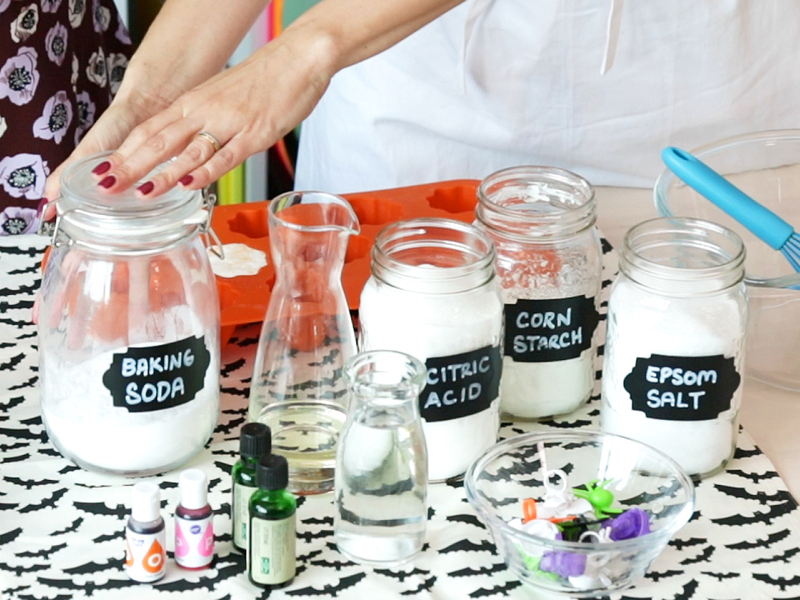 Get a mason jar, crumble your mixture into the jar and call it Fairy Dust. It will work just as well. Major save.